Worley Family: Grant's new "bed"
We have been having trouble with Grant staying in his bed after we put him down for his nap or for the night. So for the time being, we have moved Grant from the boys' shared room to the guest room so as not to wake Mason from sleeping until we can get this under control. So Grant knows well the rule that he is not to get out of his bed. If he does, there are unpleasant consequences. We're trying all sorts of things (any suggestions are welcome). One day I had put him down for his nap. I had gone in a couple times to check on him and he was awake, but in his bed, so I was feeling like perhaps we had made some headway. I was working around the house doing all sorts of things. I went in the guest room to check on him again and he was nowhere to be found! He wasn't in his bed. I looked on both sides of the bed and he wasn't there. I opened the closet and he wasn't there. I looked in their shared bedroom and he wasn't in that bed, either. By this time I was nearly in a panic, searching the house over, wondering how he could have disappeared when I was here the whole time. And then I decided to look behind the bed. 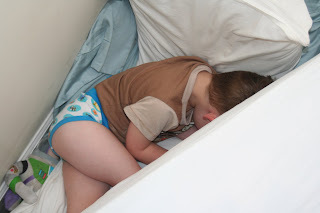 And sure enough, that's where I found him - between the bed and the wall, snuggled up on all the pillows that he had piled like a mattress. I took a video. Unfortunately, I can't upload it to this computer. Once we get our regular computer fixed, I'll have to share it. 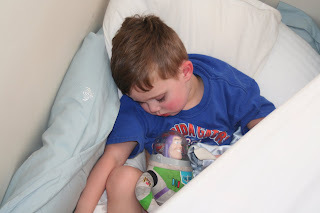 :-) For now, you can see Grant's new favorite place to sleep almost every time he goes to bed. At least it doesn't send me into panic any more. That is too cute!! I have a suggestion for keeping him in bed. Bren is really responding to the reward system right now. Have you tried a sticker chart. Each time he stays he gets a sticker and after X # of stickers he gets a toy/suprise. Bren doesn't care about punishments at this stage but her sure does care about stickers and ice cream!! Oh ya and it cracks me up that he still loves Buzz so much that he sleeps with him! Bren has never seen Toy Story...we should watch it!